Jeremy's suppose to be working all weekend on a presentation that's coming up. He's been a little anxious about the amount of work that has to be done in the next two weeks or so. (How come Sept/Oct seem to be the peak time for commitments both work and social?) Vince was gone with a friend all day today. 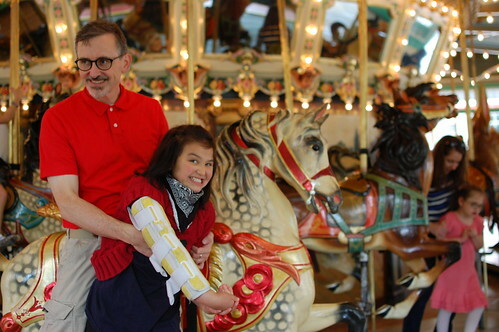 Edda had a friend's birthday party at 2:30 this afternoon and I told Jeremy that it was OK for him to skip it, but he was feeling unproductive as I was getting ready to leave - so he ended up going with us to the Glen Echo carousel. Edda was really happy he came. 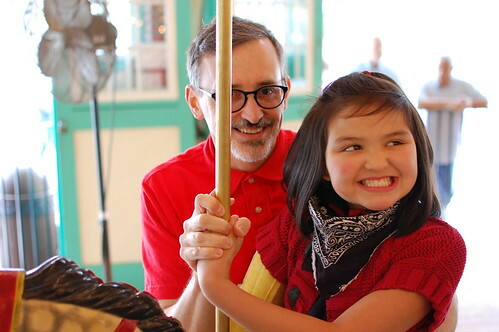 She did love getting on the carousel and getting off the carousel, but was a little nervous throughout the actual ride. Jeremy also managed to get Edda stuck in a toddler bucket swing - which happened out of my sight, so he had to ask two strangers to help him un-wedge Edda out of it. I think I'm glad I wasn't there to witness it. Oh Doris that is such a lovely picture of Edda and Jeremy. Sorry about the wedge too! Back to school for everyone. Ice cream in the mail. To be - as it is.